Are you one of the 45 percent of Americans who made New Year’s resolutions? If so, I hope you’re also one of the 8 percent who actually keep them! Some popular resolutions such as “lose 10 lbs.” or “run a 5k” are actually goals, not resolutions. A goal is a specific, one-time achievement. It’s easy to tell when you’ve achieved it. Once you’ve done it, you’re done! A resolution is a decision or determination to permanently change your life; it’s ongoing. Because so many goals and resolutions are unfulfilled, they may not carry the compelling power we need to succeed. It can be discouraging to strive toward a specific destination and not reach it. Goals imply that unless you accomplish exactly what you’ve said, you may feel you’ve fallen short—or worse, failed. I wonder if there is different way to view and label what we’re trying to achieve. What if we allow progress toward a goal to give us a tremendous sense of growth and success? Instead of aiming at a ‘goal’, I wonder if the word ‘target’ would be more inspiring and effective? A few years ago I decided to learn to shoot a shotgun and handgun, a hobby that would allow me to spend time with my husband and three adult sons who are hunters. As with most skills, shooting well requires training, time, practice and more practice. And even then, I wasn’t a sharp shooter—nor did I expect to be. I learned, though, that I could hit the target … and periodically the bull’s-eye. Little holes pierced my target sheet, evidence that I was getting close to hitting that specific goal we call a bull’s-eye. I was so thrilled that I hung those target practice sheets on the back of a door! 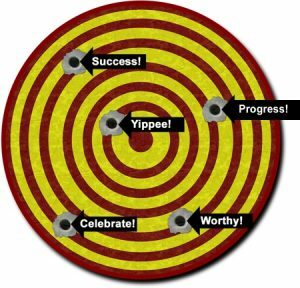 What if we find joy and claim success when we hit the target that surrounds the bull’s-eye? That analogy strikes me as a good one for achieving what we call goals. The “me” I aspire to be. I’m 100 percent committed to “progress, not perfection” in my life, so much so that I literally wrote a book on the concept! That’s why hitting the target fulfills me. Getting a bull’s-eye is exciting, fun, inspiring and special. Yet, hitting somewhere on the target is also worthy! If you’re someone who refuses to settle for anything less than perfection or the bull’s-eye, than this post will probably annoy you. Feel free to read another blog. If, however, you’re tired of exhausting yourself trying to be perfect—maybe even trying to outperform others who have more time, talent or experience—then maybe, just maybe, I can offer you some encouraging words today. Go ahead and center that bull’s-eye in your scope to name your ultimate goal or ideal outcome. Now picture a larger circle around that tiny circle in the middle. Aim at this larger circle and shoot for success, whether it’s a behavior change, attitude adjustment or just letting go of something. When you hit the target, claim success and celebrate! Now shoot again. And again. You’ll no doubt get closer to the bull’s-eye the more you work at it. Learning: What do I want to know more about? How can I ensure I am more valuable and influential in a year, specifically at home? At work? Connecting: Whom do I want to know better or reconnect with? Releasing: What limiting belief, negative self-talk or reactive behavior would I like to release so I can experience success? What relationships might I need to release? Interestingly, my clients with releasing objectives have experienced the most rewarding, life changing and freeing successes. I’ll share more details about releasing targets in my next blog. Click here for a free download of my book, Progress Not Perfection: Your Journey Matters to help you shoot for the targets that mean the most to you.